Special Screening of "Special Deliveries"
03.05.12 Watch the second part of Ricki Lake's "More Business of Being Born," plus a live Q&A with two star moms! 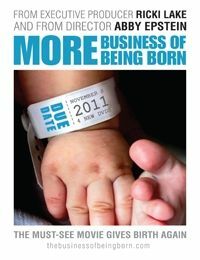 Mark your calendar for a free online screening today of Special Deliveries: Celebrity Mothers Talk Straight on Birth from the popular DVD series More Business of Being Born. In addition, celebrity moms Alyson Hannigan and Kellie Martin will join the movie's executive producer Ricki Lake and director Abby Epstein in a live Q&A chat immediately after the screening. When Lake talked to Fit Pregnancy about her first movie, The Business of Being Born, she discussed her goals in making the groundbreaking movie. "I really hope women get the information they need and, as a result, are able to have a better birth experience." The Special Deliveries installment in the DVD series features such celebrities as Hannigan, Martin, Laila Ali and Gisele Bundchen and other star moms sharing their birth stories. They openly talk on camera about the good and the bad about their birthing experiences. The screening will start at 6 p.m. PST today. To join the live chat after the airing, simply send a tweet to @rickilake with #mbobb as the hashtag.